The Cooker Guard Timed Oven Safety Unit turns off the oven if it is on too long or gets too hot, providing safety and protection for those suffering from dementia. There are a number of dangers that have to be taken into account when someone suffers from dementia. Halfway through a task, they move on and forget what they were doing. In most cases, that is fine. When it comes to cooking, it is not. Forgetting to turn the oven off can lead to fires, injuries and even death if left unchecked. With the use of the Cooker Guard Timed Oven Safety Unit, you do not have to worry. If your loved one forgets to turn off the cooker, the guard will do it for them. The Cooker Guard is suitable for a range of people who have early dementia or Alzheimer's. The guard does not change the way the cooker functions in any way, but is there to prevent accidents from occurring. When the cooker is being used daily, it will operate the way it has always done: the guard will not interfere. But if the cooker begins to get too hot, it will sound a warning. If this heat continues to build and no action has been taken, the guard will then switch the cooker off. A time-limit is also in place. If the cooker is left on for too long, the guard will again disconnect the cooker and turn it off. The timer can be adjusted between 10 - 120 minutes and starts again after the cooker has been switched off. Once power has been disconnected, the user must turn the oven on and off again as well as resetting the guard. The guard cannot turn the cooker back on, for obvious safety reasons. 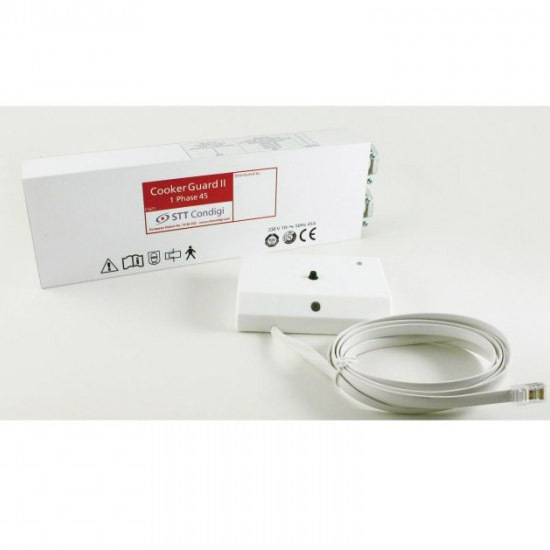 The cooker guard is formed of a sensor unit and a control unit. The control unit is mounted behind the cooker and is responsible for cutting the power. The sensor unit is positioned above the cooker and monitors the heat radiating from the hob. Both light and sound alarms are used. When the LED is green, the cooker is on and the countdown/monitoring is active. If it turns orange, the temperature is too high and if red, the power has been cut. A short beep indicates the change to orange and a long one to show the power has been cut. Once the countdown has begun, an additional 60 minutes extra time can be added on. This is achieved by pressing and holding the button on the sensor unit until the light flashes green five times or the long beep is heard to confirm the extra time has been added. The control unit is made from metal while the sensor unit is plastic. Both are available in white.